For starters, it is a physically appealing site. Because this national park actually encompasses a number of smaller sites from different eras, it is spread over a somewhat larger plot of land, connected both by roads and walking trails. Plus, situated between the upper and lower Shephela (the foothills that lie between Israel’s Coastal Plain and the Judean Mountains), the site is surrounded by picturesque rolling hills. On my most recent trip these were covered by lush green grass, colorful wildflowers, and even what appeared to be wild wheat. Combine this with the fact that the site is rather well-maintained, and has an abundance of locations to visit, and you get an archaeological site that almost has the feel of a theme park (in a good way). Plus, due to its size and physical spread, the location doesn’t feel quite as crowded as some of the more famous sites, such as Masada or Caesarea. 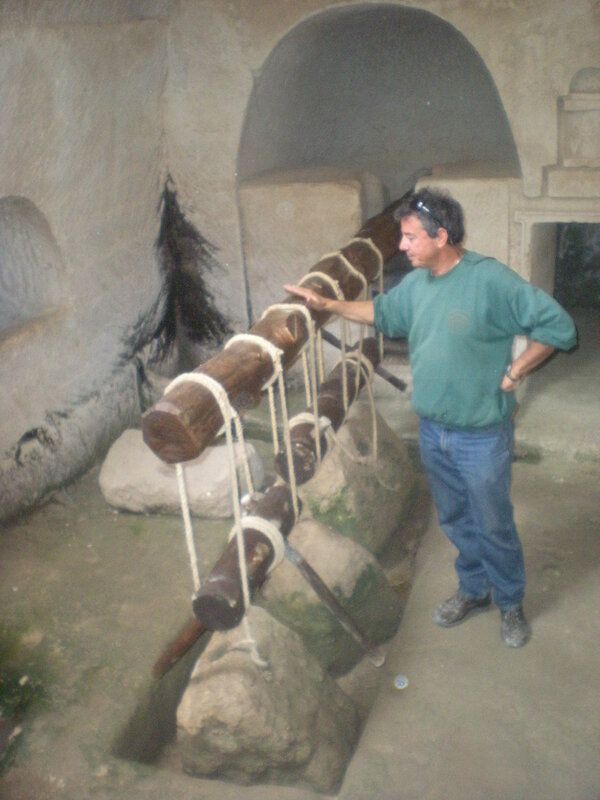 A reconstruction showing how an olive oil press worked, in one of the many underground facilities. 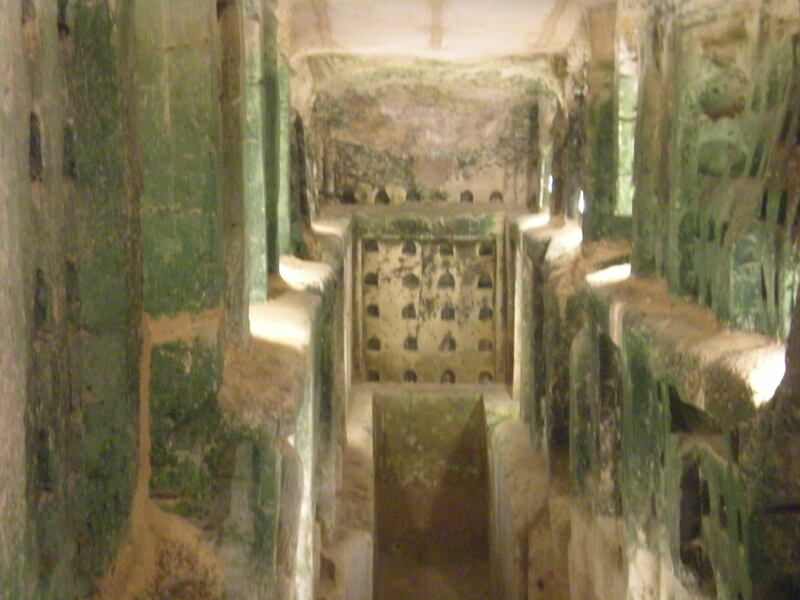 What’s somewhat interesting is that there is relatively little at Beit Guvrin-Maresha with direct Jewish relevance. But the finds there have given a window onto life in the Holy Land when Jews lived alongside other peoples. There are overlapping customs of a quasi-Judaic nature, some of which relate to the debatable and potentially dubious tale of Edomites who were forced to convert to Judaism. In fact, it is from this group and this city that the complex character of Herod is said to have come. Herod the great builder and ruler of Israel, who was also equally vicious and ruthless to his subjects. One of the major features of Maresha is its system of man-made “caves.” The hills in this area are made of soft chalk (kirton in Hebrew), with a hard shell on top (locally called “nari”). So once people dug a small hole in the nari, they were able to easily quarry out bricks from the chalk. Thus they had building materials for their homes above, and were left with usable basements. These underground chambers became the location of a lot of the industry of the city, since they were cooler in summer and warmer in winter. And thus, Maresha has a tremendous quantity of archaeological finds as well. There are 169 cave systems with approximately 5000 rooms here. There are 85 columbaria (dovecotes) and 23 olive presses (one of which was found in pristine condition, just completed but never used). There are also numerous cisterns and burial caves. And there is a beautiful system of 80 or so interconnected “bell caves.” These are large underground quarries (mostly 40-50 feet deep, with the deepest at 82 feet), from a later era (Byzantine and Early Muslim). To maintain structural integrity, the caves were dug out in a domed bell shape. Me holding a 2000+ year old coin that I found at Maresha. 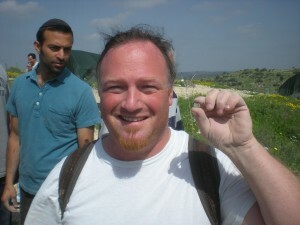 For many, however, the highlight of a trip to Beit Guvrin-Maresha is the “Dig for a Day” program. There is a tremendous amount of artifacts inside the various cave systems, many of which are still unexcavated. But luckily these are not sensitive sites, since most of the caves were filled on purpose by people dumping things inside. So most of them have no real strata (time-bound levels), and thus it is less important how deep inside things are found. So the program gives regular people the chance to help excavate the site, while also learning a drop about archaeology in general. First you enter a cave and fill buckets with dirt, often finding many larger pieces of pottery and other artifacts. Then, once the buckets are taken to the surface, you sift through the dirt to find smaller items. And there are so many items in these caves that it is virtually impossible to participate in these digs and not find something. And sometimes people find some very cool artifacts. I’ve been lucky. On my first dig I found a piece of glass inside the cave, and more recently I found a tiny coin, both of which were well over 2000 years old! Additionally, diggers usually also climb/crawl through a cave system that is yet to be excavated. This is first and foremost a fun activity for those who aren’t afraid to get themselves a little dirty. But it also paints a more complete picture of the part they are playing in the overall process. By seeing what the caves you were digging in look like and comparing them to the cramped and narrow spaces of an as-yet unexcavated cave system, you get even more of a feeling of accomplishment. I highly recommend a trip to Beit Guvrin-Maresha in general, and participation in the Dig for a Day program in particular. The trip is good for people of all ages. as your biggest fan, I continue to comment your blog and hope lots of other readers will to do so aswell. 1.) Nebuchadnezzar II conquered Judean Kingdom in 6th cent. and sent inhabitants into exil. This in fact was the end of Maresha as a Jewish (or Judean) city and thats also the reason why you will hardly find any Jewish stuff there. b) Yes, I was also very impressed by the Columbarium. We have been told, that maybe they brought pigeons from here to the temple. The strange thing about it is just, that the holes for the pigeons are very small, in fact too small! So maybe pigeons were just smaller in these days or the place was used for another purpose. c) During the “Mered Gadol” there was again a big Jewish Population in the city and I think that Vespasianus killed some 10.000 over there. I do not remember, if the caves have also been used as secret hiding place for the rebels. Do you remember anything like this? e)About the amphitheater: I do not remember where were the other three amphitheaters in Israel? Beit Shean? Caesaria? and Tiberias maybe??? I think the special thing about Beit Guvrin was, that the Amphitheater was built as a Amphitheatre from the beginning. All the others were Hippodroms first and then just turned into a Amphitheatre. And of course there is not place where you can still recognize so many details. The wild animals who fought here were kept in the dungeons under the theatre; when it was time to appear for the show they were hauled up to the arena by an elevator. Sorry it has been so long since I’ve posted something fresh. Hopefully I’ll rectify that today. In answer to your question, Tiberias has a theater, but not an amphitheater. The other three are Beit Shean, Caesarea (as you mentioned correctly) and Samaria. I suddenly came across your excellent blog. I am living in Norway and in october I will travel to Israel for the 4th time. There is still so much to experience there. The big dig was new to me, so I will certainly try it out as that looked like a fun experience. Cool! Welcome in advance. If you have any questions ahead of your trip, let me know! I love Bet Guvrin and you described it well. In the summer we go there to cool off in the caves but have never participated in any of the digs. How is that organized? If you click on the link for the “Dig for a Day” program in the post (next to your brother’s head) it will take you to the page for the program. You can learn about how it works there!